To be perfectly honest, roller skating is something that I have thought very little about in the past several decades. The only reason I mention it now is that my daughter recently read a graphic novel about roller derby that piqued her interest and she wanted to give roller skating a try. It turns out "The Rollercade" is just a little over two miles from our house and so last Saturday I took her there so we could tie rental skates to our feet and have a go of it. I honestly can't remember the last time I had done this but my best guess is that it was around 1989 and that it was at the "Skate Connection" in Arlington. My general impression of "The Rollercade" in the late 2010s is that it is basically identical to the "The Skate Connection" in the late 1980s. The dim lighting, the disco balls and the polished parquet floor (with a rough patch in the corner where a roof leak had warped the wood) was all eerily familiar. Some of the music was new of course - songs from Taylor Swift's 1989 were not available in 1989 - but "The Hokey Pokey" and "Thriller" seemed to be played directly from the playlist of my youth. Although modern four-wheeled roller skates and the rinks where they were deployed date back to the mid-1800s they became a staple of the American suburb in the 1950s. 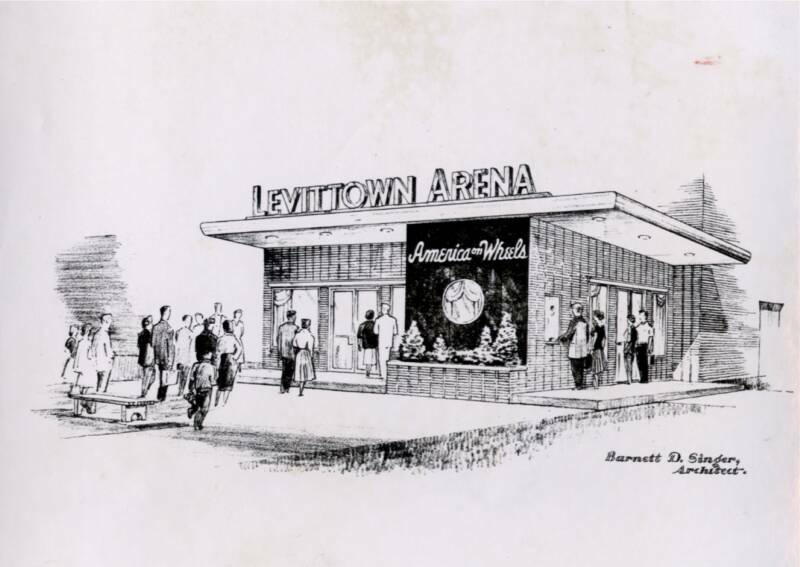 The wellspring of post-war American suburbs, Levittown, naturally had its own mid-century skating rink. Roller skating underwent a renaissance in the late 1970s and early 1980s when polyurethane wheels improved the skating experience and disco music gave skaters something to do. Although the inline skating boom of the 1990s saw a renewed interest in skating as a sport, part of their appeal was that this type of skating could occur on any paved surface and so did not require a trip to the local rink. As a result the skating rink itself remained in a state of arrested development: the lights may be updated to LED and Tab may no longer be offered at the soda fountain but otherwise the roller skating rink of the 2010s is basically the same as the one of the 1980s. A roller skating rink is a singular architectural experience. Like a bowling alley or a baseball stadium it is a place whose sights, sounds and smells are instantly familiar even if you haven't been inside one for a quarter of a century. I hope the memories my daughter made last weekend survive as long as mine have. I hope "The Rollercade" survives that long as well.